GeoSystems Global Corporation, an independent company born in the offices of Chicago-based problem solver R.R. Donnelly and Sons, eased the headache of navigation on February 5th, 1996, when it launched MapQuest, the first website to relieve travelers of using unwieldy paper road maps. To plan a trip, an uncertain wayfarer could easily tap out the domain name on his computer keyboard rather than unfurling an atlas, then be guided to a site where a prompt requested his endpoint. Then, with a pluck of the “Get Directions” icon, a circular, lime-green “A” would appear, and here he would enter his point of origin. With a second click of the mouse on the “Get Directions” feature next, his travel menu would magically materialize, detailing the most convenient path through the country’s arteries, complete with highway signage and mileage tallies. At last, a trip planner could relax, fairly assured that he would arrive soundly, or at least without an unplanned stop at a local gas station to ask for directions. The fear of losing one’s way affects all varieties of travel. In foreign cities, a simple stroll to a local grocer can be handicapped by unrecognizable street names. Likewise, a bicycle ride through hilly, forested terrain can become oddly reminiscent of a Brothers Grimm fairy tale as roads begin to branch off, winding in different directions. Unfortunate, too, is that there exists no MapQuest for one’s lifestyle, either. Rather, each member of the human race is led along a wooded pathway of his own, where only his point of origin is known. Ever walking toward a nebulous endpoint, we can only look back reminiscently to account for each lively occurrence that goaded us forward, bringing us from there to here. Aware of the advantages of studying abroad, Pascal was equally savvy to the linguistic trades that occur when scholars re-locate to foreign shores. Upon graduating from a strict professional school in Bordeaux, Pascal stood witness as many fellow graduates left for England, where most would take advantage of the new setting to gain a fuller comprehension of English. However, like his future wife, he preferred French soil and remained, spending winters at Courcheval, a luxurious resort in the French Alps, and summers in Cannes, Nice, and St. Tropez. Eventually, he grew aware of a need to plant roots, though, and moved to Paris, where he began at The Barfly, a celebrity watering hole, before venturing into the truly fine dining room of La Maison Blanche. Located on the Rue Montaigne in Paris, it was right off of the Champs Elysees, where he met his wife. That summer, the pair traveled two-and-a-half hours north for a Chicago visit, an inspiring trek that foretold exactly what he had gotten himself into. To follow his term with Chef Ala, Pascal ventured to Chicago’s River North area, where he worked alongside Kiki’s Bistro owner, Georges Cuisance, “a Frenchman not unlike those who came to America in the ‘70’s around Maxim’s time.” Within three-and-a-half years, the pairs’ pursuits resulted in a peak in business and prospective plans to buy the twenty-three year old French favorite from its proprietor. But like the branching-off of roads as they twist through hilly, forested terrain, leaving one to wonder where he is standing, so an unexpected disappointment in the plan would result in finding a newer path. From there, the enterprising young Frenchman cast a decisive glance northward, eventually discovering a vacant storefront on Church Street in suburban Evanston. Its suitably boutique vibe jib ed with his sense of casual, urban class. Feeling a good fit, he began to quickly contact each party concerned with leasing security, city permits, and licensing, and opened Bistro Bordeaux’s doors forty-five days later. Here, he continues to lure the public away from its collegiate concerns, shopping lists, and family matters, all while providing for a family of his own. 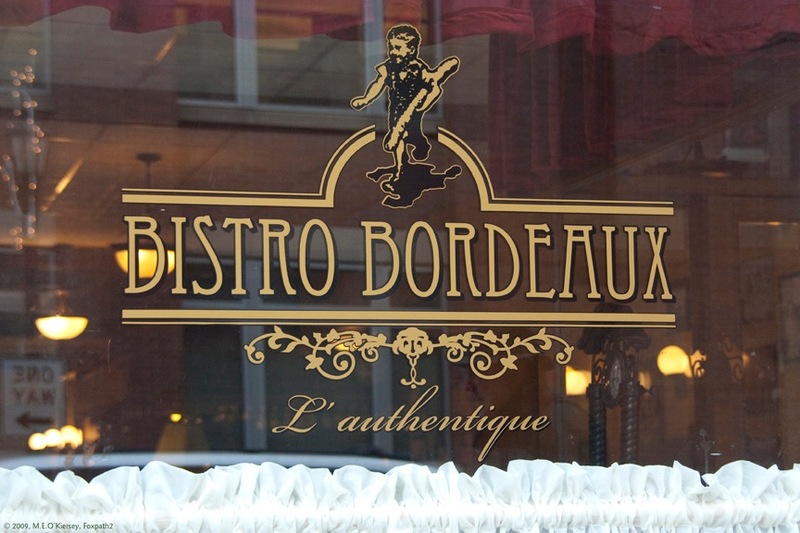 A true success story, Mr. Berthoumieux’s Bistro Bordeaux is a testimony to his stalwart refusal to turn back and assess the path that led him from Paris, France, to Evanston, Illinois, but instead to rely on the influences that carried him from there to here.